Planet Oasis, a multi-billion dollar entertainment, action sports, health and wellness venue, will be developed on more than 350 acres at the intersection of Interstate 71 and State Routes 36/37, across from the Tanger Outlet Mall. The development is said to generate 15,000 to 25,000 jobs, and hundreds of millions in tax revenue to Delaware County. Construction is to begin in December 2018, and will be opening in December 2019. In terms of travel in the continental United States, Central Ohio is the center of the universe, with more than 105 million people within a day’s drive, outnumbering Orlando and Los Angeles, Glimcher said. The combination of entertainment, attractions, action sports, food and beverage, and health and wellness facilities will be the largest of its kind in the country, Glimcher said, with 15-20 attractions to start, 75 restaurants, 15-20 hotels (including Marriott and Hilton) with 4,000-5,000 rooms. Glimcher said there will be various price levels, ranging from affordable to luxury. The first thing a visitor will see as the come to Planet Oasis is a 25- to 30-story Sky Wheel and something called a Uni-coaster in a glass cylinder that goes 150-200 feet in the air. An UltraStar Multi-tainment Center will offer VIP bowling, laser tag, virtual golf, video games, movie theater, and dining. “We are so excited to be part of this one-of-a-kind venue which provided an opportunity for UltraStar to entertain so many people,” said Adam Saks, President/COO of UltraStar. Lake Mirage, a 15-20 acre saltwater lake with sand beaches, paddle boats and a boardwalk, will also be home to two hotels and specialty retail. There will be an electric go-kart venue, indoor skydiving, shooting gallery, indoor/outdoor adventure experience, and a butterfly museum that will be home to 3,000 species and welcome school field trips. An Action Sports District will have facilities for the newest Olympic sports — BMX biking, climbing, skateboarding and surfing — plus a large indoor water park, and indoor sports facility for basketball, field hockey, football, lacrosse, rugby and soccer. There will a conference center that will hold 7,000 people; and a 5,000-seat amphitheater for concerts and performing arts, and nightclubs. There is also an E-Sports facility that features participatory video games as part of a league. Last, but not least, there will be a health and wellness resort on the grounds called Bloom. It will focus on alternative and Eastern approaches to improving one’s health along with a spa and fitness center, and will include a lab that will produce nutritional supplements. Speakers described Planet Oasis as a development that will bring Ohio to the worldwide stage, while also providing community festivals. Glimcher said the emphasis is on bringing unique experiences to families of all ages and incomes. 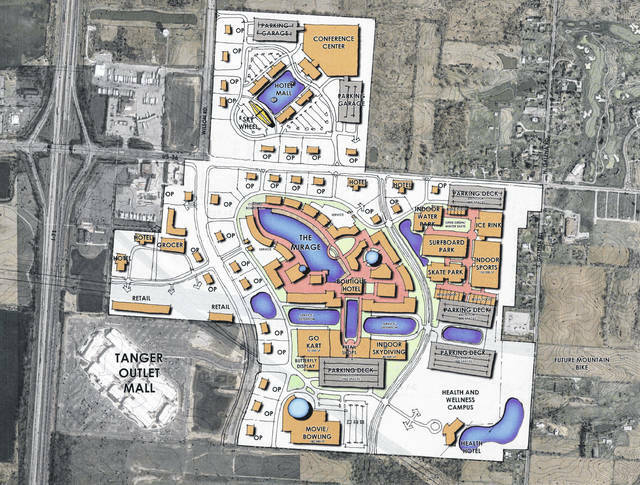 This is the master plan drawing for Planet Oasis, a multi-billion dollar development in Berkshire Township. https://www.galioninquirer.com/wp-content/uploads/sites/38/2018/07/web1_Planet-Oasis.jpegThis is the master plan drawing for Planet Oasis, a multi-billion dollar development in Berkshire Township.